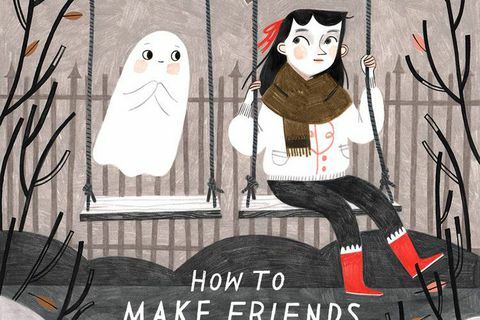 Book Reviews Review: Rebecca Green's How to Make Friends With a Ghost, Scot Ritchie's Federica and Aaron Reynolds and Peter Brown's Creepy Pair of Underwear! Review: Rebecca Green's How to Make Friends With a Ghost, Scot Ritchie's Federica and Aaron Reynolds and Peter Brown's Creepy Pair of Underwear! The PR material that came with this book advertised "SEASONAL APPEAL: Great for Halloween & Valentine's Day." You know, two holidays with plenty of crossover action. To the publicity department's credit, this can double as a tender little love story. The ghost of Rebecca Green's how-to manual is a cuddly little guy that frequently gets mistaken for a marshmallow. Colour-pencil illustrations depict a young girl navigating her new friendship. Despite the sweetness, there is plenty of gross-out humour (favoured cuisine of a ghost includes earwax truffles and pickled boogers) and genuinely funny gags (don't confuse your ghost with a towel on a doorknob!). Green clearly had fun with the world building, frequently recommending other fictional spooky books for further research. The last few pages delve into spooky seasonal territory. The girl in the story grows up alongside her ghost buddy and we see her as an adult and old woman. The final illustration shows two ghosts holding hands in a cemetery, while the text reads, "The best part about making friends with a ghost is that you'll have the sweetest friend … forever." Federica doesn't like spending a lot of time at home. Her parents are always busy – her mom glued to the computer, her father obsessed with his creative projects – and neither spends much time cleaning the house, so it becomes a "buggy, buzzy mess." Federica prefers to spend time playing with the creatures in the park. One day, she gets an idea: While her parents are distracted, she brings her animal friends over. The raccoons eat up all the garbage, while the spiders make webs to catch the flies. Her parents, upon seeing their new spotless home, realize that maybe there's something to the idea of cleaning up once in a while. By reversing the traditional parent/child dynamic, Scot Ritchie has created a win-win: Parents get a book that encourages their kids to unplug, go outside and pay attention to their surroundings, kids get a story that doesn't moralize or chastise them and everyone gets to read a book about funny anthropomorphic animals. It's a foolproof formula: Put "underwear" in the title of a book written and illustrated by the dream team behind the Caldecott-winning Creepy Carrots!, and you'll have a bona fide hit for the pickiest young readers. The appeal of goofy underwear is reflected in-story: Jasper Rabbit is underwear shopping with his mom when he sees a display for creepy underwear ("So creepy!" "So comfy!") that resembles Frankenstein's monster. He begs his mother for a pair ("I'm not a little bunny any more!") only to become terrified later that night when he learns they glow ominously in the dark. Panicked, Jasper tries to get rid of his new underwear, but no matter what he tries – mailing them to China, tearing them to shreds – they reappear in his room. It's a fluorescent-green twist on the NFB classic The Cat Came Back plot that gives children permission not to rush their way into growing up.